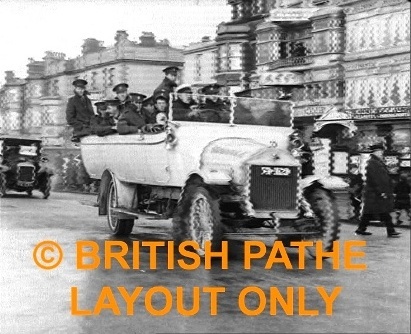 Soldiers parading, Blackpool. Pathe 1916. *(Film wrongly attributed to Liverpool). Blackpool Promenade. Small crowd stand across the street watching. First comes a white open topped car, decorated with flags and pretend cannons, some sailors sit in the back (could be women or kids in sailor suits - they look small). Next the cavalry; men on horseback riding and teams of 6 horses pulling wagons. Infantry marching led by brass marching band. They are followed by a row of charabancs carrying more soldiers. Closer same: truck passing with soldiers in back. They seem in good spirits despite the rain.